advising and making recommendations to the Chancellor regarding policies and procedures that will improve conditions for women. The Chancellor's Advisory Committee on Sustainability advises the Chancellor on matters pertaining to sustainability goals, policies, and practices at UC Merced. The committee also advocates for programs and initiatives that continuously improve campus sustainability performance. fulfill other campus-specific responsibilities identified by the Chancellor. The Chancellor’s Advisory Committee on Queer Issues (CACQI) identifies issues and makes recommendations for the inclusion and advancement of the lesbian, gay, bisexual, transgender, queer, questioning, intersex, asexual and allies (LGBTQ2IA2) communities at UC Merced. With our continued growth, we will adopt action plans to ensure forward movement in creating a welcoming, affirming, equitable and vibrant learning, working and living environment for all UC Merced community members. 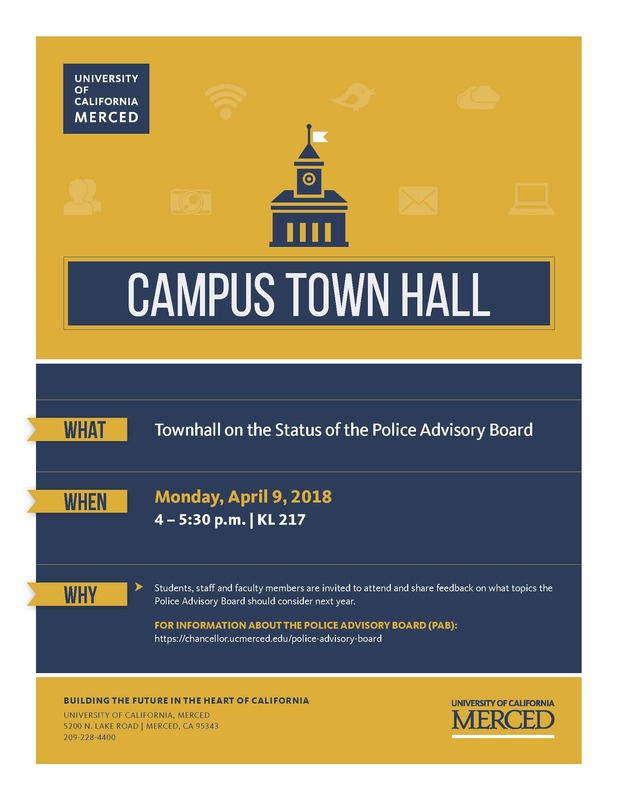 The Police Advisory Board is an independent body that will make recommendations related to campus issues and concerns, community outreach programs, training, policy development and ways to help support the goals and initiatives of the UC Merced Police Department. The Police Advisory Board does not serve as a police review or accountability board and does not formally review specific police matters. The board is a representation of the students, faculty and staff of UC Merced, comprised of no more than 16 members. Members are chosen to serve on the advisory board for their commitment to serve the campus community. The Chancellor or Chancellor’s designee will approve the final membership. A campus-wide townhall to discuss the board's activities in the coming year is planned for Monday, April 9, 2018. Download the event flier here. This task force was appointed in the spring of 2009 by then-Chancellor Steve Kang with the charge of developing and supporting the capacity for UC Merced faculty to conduct community-engaged scholarship (CES). Connecting UC Merced's research with the community is one way the university can bring value to communities and society. The Chancellor's Innovation Awards provides well-deserved recognition to teams that come up with transformative ideas that reinforce the value of innovation to the entire campus community. The Chancellor's Innovation Awards coincide with in-depth work related to strategic workforce planning that requires novel approaches to campus organizational structures and processes. Launched in spring 2016, the Chancellor’s Dialogue on Diversity and Interdisciplinarity brings leading scholars to campus to discuss pressing issues confronting higher education, explicitly linking our core values through a series of conversations and public lectures. The UC Carbon Neutrality Initiative grows out of a commitment by President Napolitano and the 10 University of California campus chancellors to work collectively to intensify and expand the efforts of the world’s premier public research university to emit net zero greenhouse gases from its buildings and vehicle fleet by 2025. UC Merced is in pursuit of this goal by 2020. The UC Global Food Initiative grows out of a commitment by President Napolitano and the 10 UC campus chancellors to work collectively to intensify and expand the efforts of the world’s premier public research university to support healthy eating, sustainable agriculture and food security. Click here for more information.